Washington - U.S. military and intelligence officials are so frustrated with Pakistan’s failure to stop local militant groups from attacking Americans in neighboring Afghanistan that they have considered launching secret joint U.S.-Afghan commando raids into Pakistan to hunt them down, officials told The Associated Press. The officials told the AP that recent discussions of clandestine ground attacks have included Gen. John Allen, the senior U.S. commander in Afghanistan, as well as top CIA and special operations officials. The White House and the CIA declined to comment for this story. Pentagon spokesman George Little said the U.S. was still focused on U.S.-Pakistan cooperation. “The key is to work together with Pakistan to find ways of fighting terrorists who threaten both the United States and Pakistan, including along the Afghan-Pakistan border, where extremists continue to plot attacks against coalition forces and innocent civilians,” he said. The U.S. relationship with Pakistan is arguably at its lowest point over the continuation of drone strikes to hit terror targets in Pakistan, the successful Navy SEAL raid in Pakistan to kill Osama bin Laden that was carried out without a heads-up to the country’s leaders and the U.S. refusal to apologize for a border skirmish in which the U.S. mistakenly killed 24 Pakistani troops. On Thursday, the State Department’s inspector general accused the Pakistani government of harassing U.S. Embassy personnel. 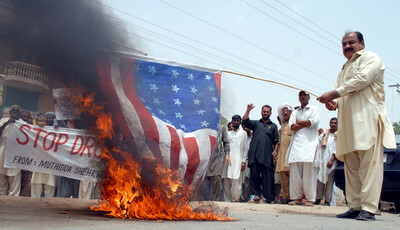 He said the U.S. was “reaching the limits” of its patience with Pakistan’s failure to tackle the tribe’s safe havens. He added that the U.S. was “extraordinarily dissatisfied with the effect that Pakistan has had on the Haqqanis.” He also made fun of Pakistan’s ignorance over the bin Laden raid at a speech in India, Pakistan’s archrival. Pakistan’s army has attacked militant strongholds across the tribal areas, except for North Waziristan, where the Haqqanis hold sway and shelter both al-Qaida and Taliban militants. Pakistani officials say that they intend to hit North Waziristan but that their army is too overstretched to move as fast as the U.S. demands. To make up for Pakistan’s inaction, the CIA’s covert drone program has targeted Haqqani leaders, safe houses, bomb factories and training camps inside Pakistan, and special operations raids have hit Haqqani targets on the Afghan side of the border, but that has failed to stop Haqqani attacks on U.S. and Afghan troops and civilian targets. The officials say options that have been prepared for President Barack Obama’s review included raids that could be carried out by U.S. special operations forces together with Afghan commandos, ranging from air assaults that drop raiders deep inside tribal areas to hit top leaders to shorter dashes only a few miles into Pakistan territory. The shorter raids would not necessarily be covert, as they could be carried out following the U.S. military principle known as “hot pursuit” that military officials say entitles their forces to pursue a target that attacks them in Afghanistan up to 10 kilometers (6.2 miles) inside a neighboring country’s territory. The U.S. has staged two major raids and other minor forays into Pakistan’s tribal territory before during the George W. Bush administration; the most contentious was in September 2008 when Navy SEALs raided an al-Qaida compound. The operators killed their target, but the ensuing firefight triggered a diplomatic storm with Pakistan. I hope we have actionable Intel to take out there Nukes , and we should back India if we need to take out Pakistans armed conflict capabilities. It is easier to fight a conventional nation state , then some quasi multi national elusive terrorist network! Pakistan's government is, and always was beig held hostage by Al Queda and other Jihadist groups. You saw what happened to that woman who returned to run for Prime Minister a few years ago after Musharaf stepped down. That was Pakistan's last chance for real democracy. Now everyone is afraid. I agree, Pakistan's nukes must be secured and there must be an operative doomsday contingency plan ready to go in case the terrorists ever take over Pakistan entirely.